Is the Africa Twin Back? Pannier (Pan-yer, -ee-er) noun: 1. a basket, especially a large one, for carrying goods, provisions, etc. 2. a basket for carrying on a person’s back, or one of a pair to be slung across the back of a beast of burden. 3. a similar type of bag, usually one of a pair, fastened over a motorcycle or bicycle’s rear wheel. We’ve all seen the shiny, brushed silver flash of a pannier outfitted motorcycle riding past on the freeway, or those roughly used panniers packed tight and rolling across the Sahara in a film. Anytime you see images of adventure motorcycle travelers, the first thing that usually pops out (after the model/make of the bike) is the panniers. From the primitive, but effective ammo cans, to the sleek, modern, boxes of today that look like they belong at the space station, the pannier has always been as important to the adventure motorcycle traveller as dice are to Vegas. Sure, panniers can carry a remarkable amount of gear but they do so much more! 11) Table It! If you’re camping or just taking a meal break during a ride, when it’s time to eat or cook, a level surface can be a challenge. 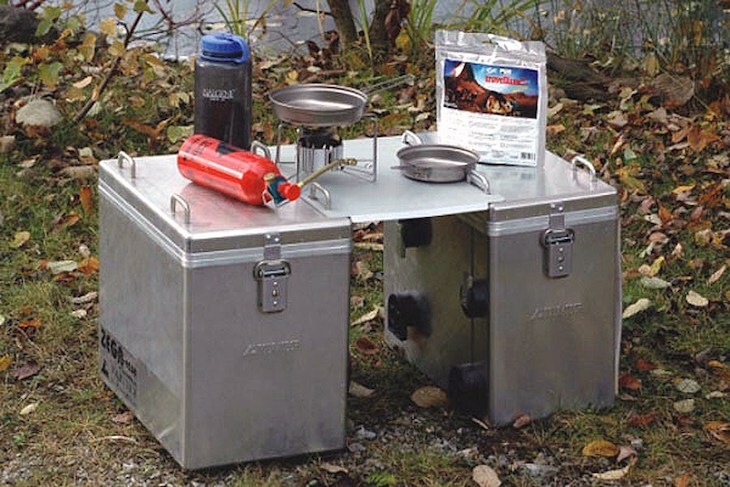 As long as you have Zega Pro panniers, you have a table! Eat on it, cook on it and then you can wash your dishes or laundry in it! 10) Sit on it! 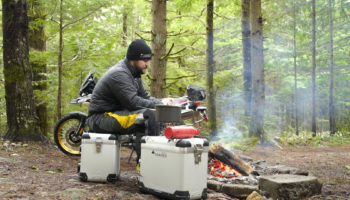 Logs, rocks and mother earth are ok when you’ve stopped for the evening and are relaxing by fire in some remote location, but your Zega Pro panniers pop off the bike quickly and easily and are much more inviting after a long day in the saddle. You can also put a couple of hot rocks in it (don’t forget to take the other stuff out) and create a warm place to sit. 9) Stand on it! Unfortunately, on occasion a rider has to do field repairs. If it’s necessary to get both wheels off the ground to fix the problem, your Zega Pro makes a stable stand in a pinch. Make sure you’re on level ground and don’t try this alone! 8) Do Your Parts! An open pannier lid makes a terrific tray for small parts and tools. Nothing can be as frustrating as trying to find a dropped bolt or nut trailside somewhere in eastern Oregon on a dark night. 7) Pack it! Maybe you and some friends are riding up to a remote lake somewhere in Arizona for the day. Do you really want to strap that electric blue Igloo Cooler your mom gave you for graduation in 1977 onto your KTM? You don’t need to. Your Zega Pro Pannier is perfect for packing with ice and filling with a few choice beverages or cuts of meat to grill. You might want to try and avoid really rutty trails, though. 6) Bear Down! Ok, you’ve spent the day fishing the Bumping River in the Cascade Mountains and had a few too many of those choice beverages you packed up there. You can’t drive home and you and your friends have a bunch of that meat leftover. Well, before you hit the sack you should all put your foodstuffs into your Zega Pro and tie into a tree. 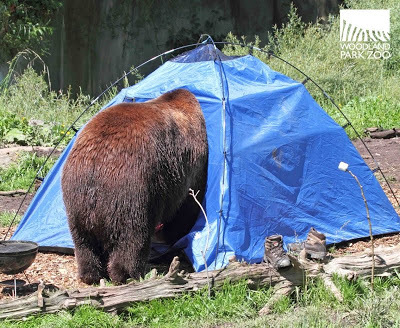 It should do the job in keeping Bears, raccoons and mongoose away from breakfast. We can’t guarantee that it’ll dissuade Bigfoot. 5) Time Out! It’s the summer of 2015 and you’ve been doing a lot of soul searching about the future of motorcycles. You want Adventure Riders from the future to share your knowledge and the knowledge of your contemporary brethren. You’ve got some travelling and repair tips that shouldn’t get lost through the years. The only thing to do is fill your Zega Pro with recordings, writings and tools and anything else you think future riders should have. Then, go to your favorite rally point and bury it three feet down and place a plaque over it that reads: Time Capsule – Open in 2065. 4) Diver Down! You’re riding the world and stopping in the greatest dive spots on the planet. You’re in West Bay, Honduras and you realize the safety buoy has broken loose and is nowhere to be found. Luckily you’ve got your panniers. Grab some rope and head out. Your Zega Pro will float and can be easily tied to an anchor. You can even put a dry change of clothes in it so after a day under the breakers you can hit the beach side lounge. 3) Cross Here! * You and your group have been exploring the Colorado Backcountry and you come to a deep swiftly moving river at the end of a long wooded trail that took you most of the day to traverse. The bridge has been washed out! What do you do? Luckily each of you (all five) have Zega Pro Panniers. First, get a line and a couple of people to the other side. Next pop off those panniers and tie them to a bike (all ten of them). Put it in the water, tie it to the line and float it across. 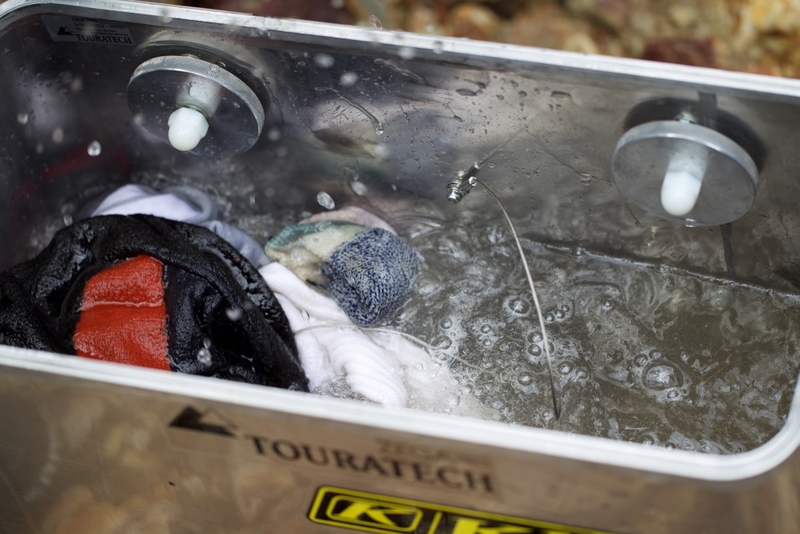 Get the Panniers back across and repeat four more times… If you’re doing this make sure you shoot video and send it to Touratech-USA. 2) Put It Out! It’s time to head back to the grind after a sweet week of riding and camping. Stop! You can’t leave those smoldering ashes there. One good gust of wind could create a catastrophe! Grab your pannier, before you pack it. Dump the rocks you used for heating your seat last night, walk over to the bubbling brook and fill that Anodized Aluminum All Purpose Camping Utility with water and put out that fire! 1) Get Cooking! * When you’re traveling, packing around a pot or a pan can take up space that can be better used for other things. If you’re looking for a way to fry a fish or a steak, heat a hot dog or even boil water, just set your Zega Pro pannier next to the fire and flip the lid over it. Kablam! It’s a cooking surface! We recommend doing this with non-anodized boxes. *Most of the above are tested and a couple of them are pure speculation. We’d love to hear more ideas from you about the ways you use your panniers besides carrying things.